There are lots of little things that don’t warrant their own posts, but are fun to share anyway. Chopsticks = next best thing to an actual whisk. I think I saw this on television, so I can’t claim credit, but it works like one of those handheld cappuccino whippers. 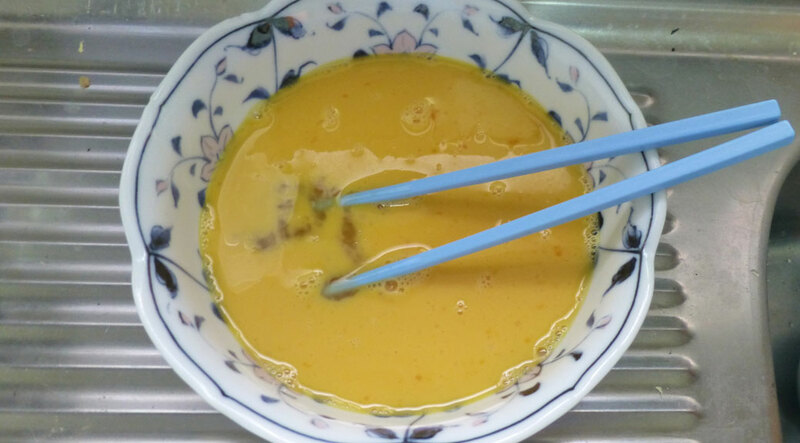 Eggs, batter… if you can whip it, you can whip it with chopsticks! Forget the Japanese. 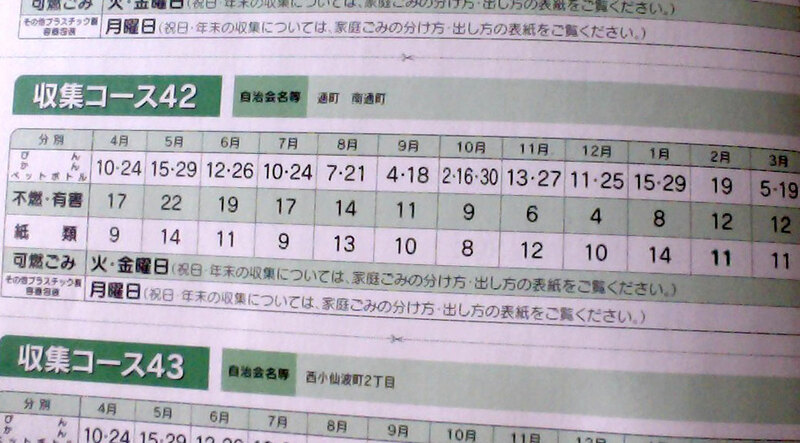 This schedule would be complicated in any language! We take garbage to the curb four times a week. General trash, known here as combustibles, goes out twice a week. Plastic packaging goes out once a week on Mondays. Paper goes out every fourth or fifth Wednesday. Glass bottles, cans, and plastic bottles go every other Thursday and each type must be separated into its own bag. Instead of donating unwanted goods (or non-combustibles) at a Goodwill-style store, items are placed on the curb once a month. They’re up for grabs for anybody walking by. We’ve procured two nice overhead lights and our gas cooking range from the non-combustible piles around the neighborhood. We’ve seen golf club sets, furniture… basically anything you’d find in a donation store. I have a spreadsheet and a Google calendar to help keep the garbage schedule straight. Seems like a complicated garbage schedule would reduce participation in recycling. Do you see that happening? I thought the same thing, but it doesn’t seem to. The NY Times did an article about it in 2005 that seems to ring true. Particularly, “In towns and villages where everybody knows one another, not sorting may be unthinkable. In cities, though, not everybody complies, and perhaps more than any other act, sorting out the trash properly is regarded as proof that one is a grown-up, responsible citizen.” A group of women in the teaching program were greeted by their new neighbors, not with a friendly hello, but with an explanation of how they needed to “perfectly” sort their trash. The trash collection sites are managed by the neighborhoods, so it probably depends on the neighbors more than the individuals. Our area seems pretty laid back… so far!